A review of Leadership, Crisis, and Political Change: The End of the Formative Period in the Nepeña Valley, Peru, by Hugo Cesar Ikehara. Most regions of the world have seen moments of crisis, and historians will tell you that all great civilizations fall because of them. Archaeologists use changes in material culture, settlement, and lifestyle to track the rise and collapse of societies over thousands of years. There are two such moments of collapse and reorganization on the North Coast of Peru between 1200 BC and AD 500. The first is the dissolution of a pan-Andean religious tradition, frequently referred to as the Chavín culture—a ritual and material cultural complex that extends over wide stretches of Peru and is estimated to have lasted for hundreds of years during the Formative Period. The second is the final decline of the Chavín culture around 200 BC, during which the Moche state formed and expanded its reach into neighbouring valleys. Ikehara’s dissertation seeks to understand the nature of these two disturbances in the middle of the Nepeña valley of Peru, and how local leadership dynamics in the Middle Valley responded to disruptive external stimulus. Rather than couch his analysis in the familiar rubric of “collapse”, however, he sets the study of these cultural transitions using Seeger’s (2002) notion of “crisis”: situations of high social stress due to uncertainty, systemic threats, inhibited regular functioning and reduced response time. His focus across 1700 years allows him to examine how two new systems of leadership and political organization emerged out of the old. The work responds to key anthropological questions into how leaders of egalitarian societies influence social circumstances, such as internal pressures and external opportunities, to build social networks and grow their renown in ways that benefit the community, but also might result in transformative processes—sometimes resulting in social hierarchies or inequalities. Based on the theoretical insights of Timothy Earle, Liz Arkush, Chip Stanish, and others, Ikehara evaluates the relative influence of trade, control of agricultural production, and warfare in the transformation of societies in the Middle Nepeña Valley. The analysis also draws on the insights of Robert Drennan and Christian Peterson for regional data collection approaches, the identification of meaningful units of interaction, and the spatial analysis of the data. Through this approach, Ikehara’s study relies almost entirely on the analysis of systematic surface collection data to learn about the political dynamics in the Middle Nepeña Valley. The dissertation is divided into 11 chapters. In Chapter 1, Ikehara reviews the ways that anthropologists have considered the emergence of social hierarchies, the disintegration of multiple levels of political organization, and contrasts the use of the “collapse” lexicon with the advantages of a “crisis” concept approach. He charts a different trajectory for the Middle Valley Research Zone than previous surveys, available due to Shibata’s (2010) newly refined ceramic sequence. And of the new sequence, he asked how was the population of the Middle Nepeña Valley distributed? How did it changed over time, and how was it integrated into territorial units? He also addressed how and where leading households were located in the region, and whether these households were associated with activities that might have brought them prominence. Next he asks how public architecture was integrated in the region’s populations over time, whether either crisis was associated with changes in the level of conflict, and how the Chavín religious complex was related to other changes in the Middle Valley. In Chapter 2, Ikehara provides an overview of the physical geography and cultural context of the study in the North Coast of Peru—a desert strip on the coast that leads up to the foothills of the Andes Mountains. He outlines hydrology and the propensity for agriculture, key features relevant for human settlement, while delving into the cultural history of the region, detailing the extent of previous pedestrian survey in the Nepeña Valley (a 74 km east-west stretch). He also provides relevant outlines of previous work in Casma Valley to the south, and the Santa Valley to the north. Ikehara will return to the populations in these adjacent valleys because of their interconnected nature, the mobility of people on the North Coast, and the changing population levels across the region. For decades its been known that the rise and fall of the Chavín religious complex had strong consequences for the greater area, but the existing evidence for the Nepeña valley was equivocal, with little known about how local populations responded to these greater regional changes. In Chapter 3, Ikehara details his methods—mainly his use of surface refuse distribution as a proxy for population and activity, and his proxemics approach to monumental architecture—and summarizes the numbers and distribution of collection units. Ikehara relies upon systematic surface collection following a pedestrian transect survey area enclosing 87.8 square km. The method follows in the tradition of Jeffrey Parsons and Richard Blanton, but also makes use of much more recent improvements to systematic survey developed by Peterson and Drennan (2005). Like them, Ikehara uses a target sherd number as a threshold for collection, and natural field boundaries (enclosing around a half hectare) as a basal unit of analysis. This collection strategy permits a specific error range and confidence level for the numerical estimates, and provides a more comprehensive ability to model demographic patterns and perform quantitative multi-scalar analysis of economic and political organization. In Chapter 4, “Identifying Leaders,” Ikehara develops the logic behind using ceramic finewares as a measure of relative social rank, and describes other classes of artefacts and activities that might be associated with them. For example, ceramic scrapers used for potting are common in the area, while exotic wares are likely the result of a trading interaction, and therefore an indicator of one’s exchange savvy. Both, therefore, are used in the collection units as identifiers of these specific activities. In the Late Formative and Early Intermediate Period (EIA), Ikehara points out that high ranked households occur within or close to areas with higher density populations, but in the Final Formative, many higher ranked households occur outside the larger population centers. There seemed to be no control over pottery production by elites until the EIA, when exchange networks also principally fell into their domain. In the next three chapters, Ikehara addresses whether the distribution of people in the Middle Valley is related to craft production, exchange, agricultural productivity, or ritual architecture. In Chapter 6 he finds that the location of ceramic production changed over time, and in the Late Formative, one of the main communities likely did not produce enough ceramics to meet its own needs. By the Final Formative, much of the ceramic production occurred at the margins of the central populated areas, and was traded in, before becoming centralized in populated areas in the Early Intermediate Period. By contrast, exchange in the Late Formative exotic ceramics are present in areas of dense occupation, but entirely disappeared by the Final Formative, when the Chavín religious complex finally collapsed and warfare threatened the region from outside. Exchange between the Middle Valley and the outside emerged again in the Late Intermediate, however, clearly associated with high-ranking households. In contrast, agriculturally productive land didn’t form a clear source of leadership control at any point in the Middle Valley, though the dominance of water canals does seem critical to the emergence of high ranking households in the Final formative, consolidating in the EIA. Along with the population boom, the diversity of ceremonial architecture increased drastically during the Final Formative and architecture is the subject of Chapter 8. Interestingly, he shows that the construction of many buildings is never finished, and suggests this is due to failed leadership in the Final Formative. Despite the boom in monumental construction in the Final Formative, Ikehara shows labour efforts per capita clearly drop over time, likely reflecting more reasonable labour expectations over time. Compared to the Final Formative and Early Intermediate Period, construction in the Late Formative takes a disproportionate amount of energy per person, though time spent in public works gradually becomes more manageable in the EIA. Over the Formative, though, architectural layouts suggest that access to the internal ritual spaces of these buildings became more and more restricted, suggesting an emerging class of ritual practitioners. Ikehara suggests the increased density of population in the Final Formative prompted a greater interest in defining political boundaries, distinctive ceremonial architecture and identities. But ironically, the resulting political fragmentation broke down the multidistrict labour pools, making the projects impossible to complete. In Chapter 9, Ikehara reviews the evidence that conflict contributes to the emergence of leaders in the Middle Valley. Unlike in many known archaeological cases, the emergence of fortresses and walled towns in this region does not seem to be tied to the emergence of leading households or an elite warrior stratum in later periods. Some iconography and weaponry of war can be found in the Middle Valley, but it is not tethered to areas of higher ranked households. The potential presence of a buffer zone downriver separating the Middle and Lower Valley in the Final Formative, however, suggests that conflict became increasingly common, likely as a result of interactions with communities from outside the Middle Valley. In the final two chapters, Ikehara provides a summary of the social, economic, religious, and political processes characterizing the Middle Valley between the Late Formative and Early Intermediate Period, and attempts to answer how the area responded to the two crises identified in Chapter 1. In short, the Late Formative sets the scene for the Middle Valley sequence. It has a low-density population, an exchange network tied to the Chavín religious complex in the Lower Valley, and seems to have used only one ceremonial structure, displaying a fairly well integrated economic and political structure. The disintegration of the Chavín religious complex caused a crisis in the valley, and the long distance network of prestige goods exchange (found previously in the Middle Valley) collapsed by the Final Formative. The result was a profound reorganization of communities, a seven-fold population increase, and a new emphasis on building highly visible community projects. Despite the increased demand for pottery and its uneven distribution, leading houses derived their influence from control of irrigation canals and ceremonial architectural spaces. And although there is an increase in fortification and conflict in this period due to external threats, the response was one of cooperation between political units, rather than internecine warfare. The final dissolution of the Chavín religious complex in the valley and the rise of the Moche and Gallinazo polities in nearby valleys gave rise to the second crisis. The Middle Valley depopulated, and the remaining populations concentrated into two clearly demarcated polities in the east. Exchange networks rekindled during this period and reestablished a connection between the Middle Valley and the outside, with the vast majority of exotics coming in only to one dominant polity. Besides a concentration of exchange, the new elites secured their influence through increasingly restricted ceremonial spaces, and probably through providing protection from outsiders. Both major demographic centers of the period are found behind fortified walls. This dissertation addresses three important themes in anthropological archaeology. First is the question of what causes crisis and reorganization. All social trajectories experience collapse of some sort, but the conditions shaping responses to crises are often unknown. Ikehara’s work does an excellent job highlighting the potential leaders and ideologies that coexist with dominant regimes but lie dormant until a crisis occurs, when they respond and shape the events that follow. Second, this research contributes to the discussion around which factors are critical for the emergence of complex social and economic forms. Anthropologists have long debated which preconditions and catalysts bring on stable, well integrated, hierarchical societies. The Middle Nepeña Valley case demonstrates that population fluctuation can clearly have a massive effect on social organization (Johnson 1982; Feinman 2011), but it needn’t result in internal conflict or warfare, as Carneiro (1998) would suggest. The Final Formative suggests a more populous, internally heterogeneous, but cooperative society. The fall and reorganization of the leadership at the beginning of the EIA, however, is a testament to the precarity of factional leadership building (Brumfiel 1994), and the difficulty of ruling an area without control over the economic means of production (Earle 1997). The third major accomplishment in this dissertation is the integration of a modern and evolving set of survey and spatial settlement analysis tools for demographic, economic, and social comparison of archaeological data. Despite the fact that Ikehara uses predominantly survey data as the basis for conclusions, the multi-scalar nature of the dataset, the innovative metrics used to measure and estimate social parameters, and the statistical checks on the measurements make this quite a robust study. The identification of craft producing areas, polity boundaries, and interacting groups will be a terrific source of hypotheses as research continues in the Middle Valley. We can add the Nepeña Valley to a growing database of well studied archaeological sequences detailing the overarching circumstances and local conditions under which more complex societies organize. University of Pittsburgh, Pittsburgh. 2015. 338p. Primary Advisor: Marc P. Bermann. Brumfiel, E. M. (1994). Factional competition and political development in the New World: an introduction. Factional competition and political development in the New World. E. M. Brumfiel and J. W. Fox. Cambridge, Cambridge University Press: 3-16. Carneiro, R. L. (1998). What happened at the flashpoint? Conjectures on chiefdom formation at the very moment of conception. Chiefdoms and Chieftaincy in the Americas. E. M. Redmond. Gainesville, Florida, University Press of Florida: 18-42. Earle, T. K. (1997). How chiefs come to power: the political economy in prehistory. Stanford, Stanford University Press. Feinman, G. (2011). “Size, Complexity and Organizational Variation: a Comparative Approach.” Cross-Cultural Research 45(1): 37-58. Johnson, G. A. (1982). Organizational structure and scalar stress. Theory and Explanation in Archaeology: the Southampton Conference. C. Renfrew, M. J. Rowlands and B. A. Segraves. New York, Academic Press: 87-112. Peterson, C. E. and R. D. Drennan (2005). “Communities, settlements, sites, and surveys: regional-scale analysis of prehistoric human interaction.” American Antiquity 70(1): 5-30. Seeger, M. W. (2002). “Chaos and Crisis: Propositions for a General Theory of Crisis Communication.” Public Relations Review 28: 329-337. Shibata, K. (2010). El sitio de Cerro Blanco de Nepeña dentro de la dinámica interactiva del Periodo Formativo. Boletín de Arqueología PUCP 12 El Periodo Formativo: enfoques y evidencias recientes. Cincuenta años de la Misión Arqueológica Japonesa y su vigencia. Primera Parte. P. Kaulicke and Y. Onuki. Lima, Departamento de Humanidades, Especialidad de Arqueología, Pontificia Universidad Católica del Perú. 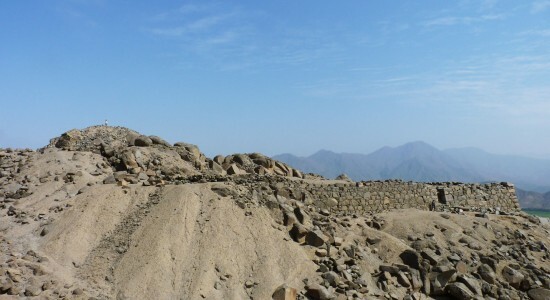 Image: Fortaleza de Kiske, Valle de Nepeña, Ancash, Peru. Photography of the author.